See us next at the 2019 Spring Fling tournament, April 6-7, 2019 at the Dover Ice Arena in Dover, NH. 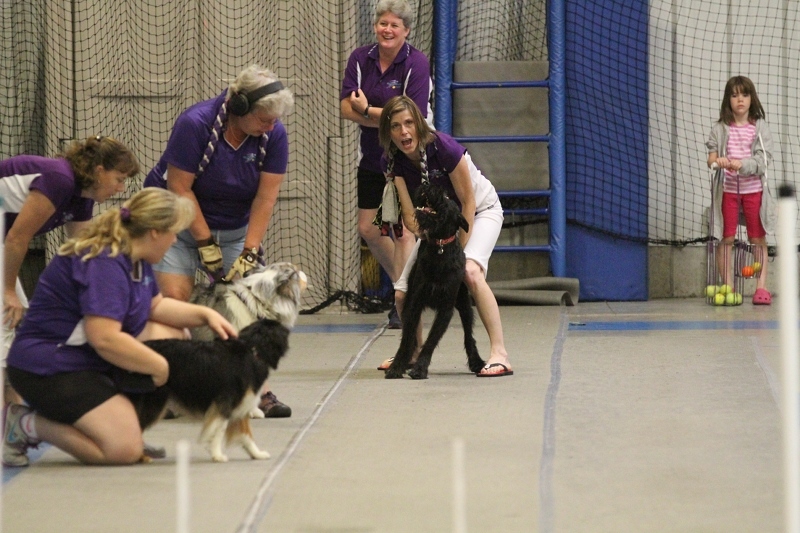 The Weston Whirlwinds have been participating in North American Flyball Association flyball tournaments since 2000. The mission of the Weston Whirlwinds Flyball Team is above all to have fun with our canine companions while training to be the best we can be and exhibiting good sportsmanship. The Weston Whirlwinds Hurricanes (Gehrig, Henna, Remi, and Zak) are the 2018 CanAm Multibreed Division 4 Champions. Regular Team Best Time: 17.238 seconds, October 2013 (Gunnar, Mattingly, Finn and Krave, jumping 8 inches). Multibreed Team Best Time: 18.479 seconds, November 2012 (Mattingly, Eika, Addie, and Zak, jumping 9 inches). 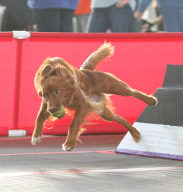 Flyball is a relay race for teams of dogs in which each of the four dogs on a team must run down a 51 foot course, jump four hurdles, trigger a "box" which releases a tennis ball, and return back over the hurdles with the ball. Each dog must run in turn and may not cross the start line before the previous dog has returned. Races occur between pairs of teams running on parallel courses and are electronically timed; sometimes races are decided by as little as one thousandth of a second. A fast-paced sport open to dogs of all sizes and breeds, Flyball is unique among dog sports in that it is truly a team sport - all the dogs on the team as well as their handlers must work together in order for the team to be successful. Weston Whirlwinds Thunder placed 2nd in Open 2 while the Hurricanes placed 3rd in Multi 1 and Lightning placed 3rd in Regular 2 at our very own St. Paddy's Day Tournament, March 16-17 at Canine New England in Walpole, MA. This was the very first Flyball tournament at Canine New England and everyone pitched in to make sure things ran smoothly. Setup on Friday took a little longer than anticipated as we worked out the best way to lay out the mats, plus we had to deal with half of the lights being missing somewhere in the UPS delivery system. But much to everyone's relief everything was in place and working in time for single dog racing at 6pm Friday (many thanks to Lorraine for camping out at the UPS facility until they dug up the remaining EJS case). Because it was such a small tournament we were not able to offer all of the usual frills, but instead stocked a hospitality table both days and hosted a potluck lunch on Saturday. Both of these extras were well received and we will seriously consider doing them again at future tournaments. The teams had a little trouble shaking off the winter blahs. Thunder (Gunnar, Jessie, Torre, and Addie) were the most consistent team, and the veteran dogs provided a solid core for Phantom's Flyball debut. Phantom did an absolutely marvelous job, racking up 125 points and earning both her FD and FDX titles. We're looking for big things from her in future tournaments. Lightning (Gehrig, Henna, Zak, and Stella, with backup by Dillon and warmups by Poison) had more trouble finding a rhythm but ran fairly well. Dillon in particular was very impressive when he replaced Stella in the middle of the third race on Sunday and had to run without a warmup - something he doesn't usually like to do. Well done Dillon! The Hurricanes (Cedar, Max, Finn, and Odo with warmups by Wicked) also had their problems but in the end ran OK. Cedar earned his FDCh-S, and Wicked was able to do several successful warmup runs and also ran a live heat in several of the races. Congratulations to our Junior Handlers Ciara (ball shagging), Linnea (Finn), and Alex (Finn) and special congratulations to Peyton for running Lorraine's GG in start on Patriot Flyball's Starting Lineup team. Thanks also to Keely for running the raffle table and to Celeste for ball shagging. Pictures of the tournament can be seen here. Weston Whirlwinds Thunder placed 4th in Open 1 at Syracuse Flyball's Reindeer Games, December 8-9 at the Syracuse Obedience Training Club in Syracuse, NY. Faced with a grueling 5-of-5 format, the team of Cedar, Gehrig, Henna, Mandy, and Addie (backed up by Dillon) struggled throughout the tournament to find their rhythm but in the end managed to put up a decent performance overall. Bright spots during the tournament: Cedar earned his FDCh and came very close to earning his FDCh-S, and Addie became the highest-pointed Australian Shepherd in Region 13. Weston Whirlwinds Hurricanes placed 3rd in Multi 1 while Thunder placed 2nd in Open 3 at Flyball MAINEia 2018, November 10-11 at the Boothbay YMCA, Boothbay Harbor, ME. Both teams had their problems throughout the tournament. The Hurricanes (Gehrig, Henna, Jessie, Zak, Dillon, and Wicked) were hit with misfortune in their very first race, when Jessie came up lame and had to be pulled. Dillon made a valiant effort at replacing him but the team never really gelled. Thunder (Cedar, Gunnar, Torre, Mandy, and Addie) always seemed on the cusp of running clean, but never seemed quite able to get things together for a consistent run. One bright spot was Cedar, who ran start the entire tournament; he still needs to work on holding his ball but he's definitely making progress. Another bright spot was Wicked, who made her debut in the lanes with some warmup runs and some live heats. Even though she didn't earn any points, it's clear that she is beginning to get the idea of what this game is about. We look forward to seeing great things from her in the future! Aside from the tournament itself everyone had a good time. The weather was excellent, and we had a great time having dinner together at the Tug Boat Inn. It was also nice catching up with our Flyball friends, especially those from Canada who we haven't seen in a while. The Weston Whirlwinds are thrilled to be the 2018 CanAm Flyball Classic Multibreed Division 4 champions. The Hurricanes (Gehrig, Henna, Remi, and Zak) were undefeated on both Saturday and Sunday, including a thrilling 5-heat victory over our friends and fellow Region 13 flyballers 2 Fast Fur U in the fourth and final race of the round robin on Sunday. Both that race and the championship race were livestreamed, so video of the races are available - the 2FFU race is available here and the championship race is available here. This CanAm (the 10th annual) was special for us in very many ways. It was the first time that the Weston Whirlwinds had a full complement of team members at CanAm, so we were able to go through the entire tournament without borrowing box loaders or handlers. It was Cindy and Mattingly's 10th CanAm. Sebastian flew in from Boston on Thursday evening so he could run Finn on Lightning on Saturday and Sunday. Mattingly came out of retirement and ran on Thunder on Friday - mostly he ran around, instead of over, the jumps, but in his last chance in the last race on Friday he made a clean run and scored a point (Mattingly has not only attended all 10 CanAm's, he has also scored points in all 10 CanAm's). On Saturday Gunnar, Jessie, Remi, and Torre all ran on Lightning in the first heat of the first race of the day and won their Irondog titles together. Zak earned his FGDCh-30K and Remi earned his MBOnyx title. The club had a total of three teams entered in the tournament. Thunder (Gunnar, Gehrig, Cedar, Dillon, Addie, and Mattingly) ran in Open 10 on Friday only. The main goals of this team were to warm up Gunnar and Gehrig for the main event during the weekend and to give Cedar a chance to run in a big tournament. Both objectives were achieved very nicely. In addition to Mattingly running on the team, Addie came out of semi-retirement to run three races so that the other dogs didn't get too tired, and Dillon did his job well the entire day. On Saturday, the club had Lightning (Gunnar, Jessie, Finn and Torre with Cedar and Remi in backup) running in Regular 10 and the Hurricanes (Gehrig, Henna, Remi, and Zak with Gunnar and Dillon in backup) in Multi 8. Remi came in for Finn for the first heat for the Irondogs run, and Cedar came in when Lightning was running unopposed, but other than that the backups were not needed. Lightning ended up 4th in their division while the Hurricanes placed 1st. For Sunday, Lightning was seeded 3rd in the R100 sub-division (R10 division) while the Hurricanes were seeded 2nd in the M40 sub-division (M4 division). Since the teams were running so well together, the core dogs were left the same. Both teams had a good chance of advancing to the finals, but Lightning ultimately fell to the long weekend and the hectic schedule and the stiff competition and failed to make it beyond the round robin. The Hurricanes, by contrast, ran unopposed in their first race and breezed through their second and third races, winning them handily by large margins. Their only real test came in the fourth race, when they ran against the M40 first seed, 2 Fast Fur U ROC Flight. Things didn't look good for the Hurricanes after the first heat, which 2FFU won by more than a second. But 2FFU had an early start on the second heat, and even though Zak dropped his ball right before the line he was able to rerun and the Hurricanes won the heat. The Hurricanes won the third heat by a tenth of a second thanks in part to a bobble by 2FFU's third dog but also due to Zak's impressive run in anchor. In the fourth heat, Gehrig had an early start and so the team lost that heat, but by then the 2FFU team was visibly tiring and running slower overall than the Hurricanes. In the fifth heat, both the start dog and the third dog on 2FFU bobbled and so the Hurricanes ended up winning the heat and the race easily. The championship round, by contrast, was almost anticlimactic. The Hurricanes were racing RUSH! Mixology, who were seeded almost a full second slower than the Hurricanes, and so even though the Hurricanes were also showing the effects of the long tournament by this time they handily won the race and the championship in three straight heats. The team had a good time hanging out at the hotel after the races, eating takeout and socializing with our friends from 2 Fast Fur U and Alaska Dogs Gone Wild who were staying at the same hotel. Many thanks to Celeste, who made the trip out to Indianapolis for the first time, and to Seb, who flew out to run Finn. We hope you had as good a time as we did. A video of the tournament can be seen here.